This was a fun one to design, since I love all things "bird" (I'm from Portlandia, after all...."put a bird on it!"). I found quite a few of these beautiful vintage images on The Graphics Fairy site, as well as many other sources, and they all came together nicely for my collage. 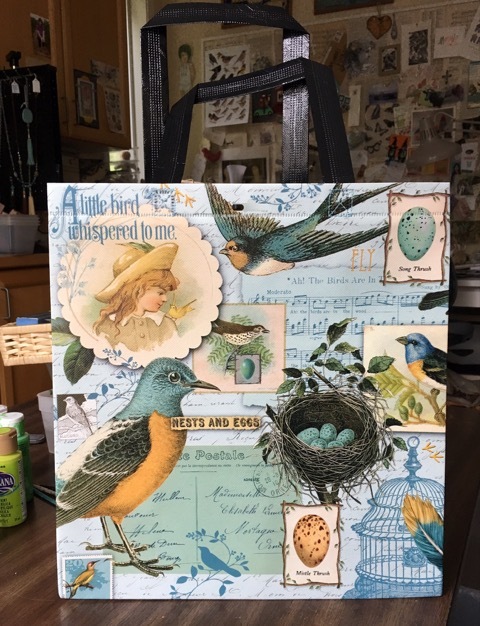 Creating it made me think of an artists' retreat I've been wanting to attend for years, Karla Nathan's "BIRDSONG" event at her home in Lawrence, KS. Yes, that's a long way away from Oregon, but I've made that trip MANY times because we have tons of family in Kansas, Missouri, and Nebraska. In fact, my daughter even attended the University of Kansas in Lawrence (ugh-- the out-of-state tuition about killed us! ), and I'm pretty sure I know exactly where Karla's home is! But the timing of her art events never seemed to align with my visits back there for school, family events, etc. Until this year! I need to go back to see my mother-in-law for her November 5 birthday (she's turning 92) and Karla's event is November 10 and 11....so, if all things work out, I hope to finally attend one of her crafty, fun soirees. And, finally, actually get to meet Karla in person....even though it seems like we've been "virtual friends" for years! These bags seemed perfect to bring along for the other attendees to use to stash all their "swag", so I offered to be a sponsor for the event. I managed to find a store locally that still had enough in stock, so I grabbed enough for everyone. I had to go to 4 stores to find them, because....good news for my tote bag client (and me)....they were all sold out at the first 3! Kansas, here I come......fingers crossed, anyway! The bag is beautiful. They're probably long gone at my Kroger but I think I'll have to take a short jaunt there just to check! 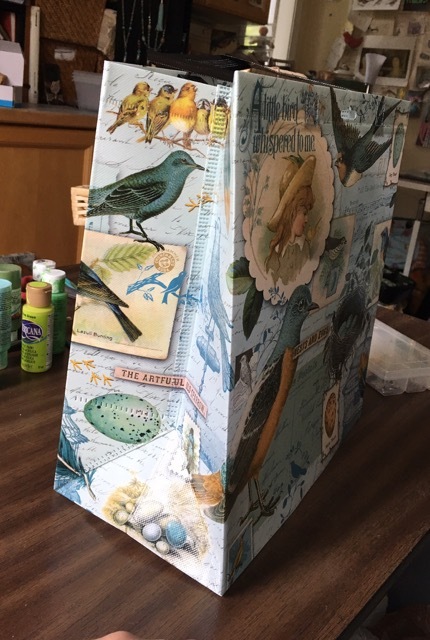 Thank you so much for the beautiful bag you designed! I loved meeting you at Birdsong and talking with you at dinner. Don't forget to watch Gulliver's Travels! Hope to see you again soon. I love your art! wow !!! beautiful and so lovely card :) i really like your good idea so much.Thank for sharing.